Weekdays: Fire Life Safety Director (FLSD) component #1 Fire Only – NY Fire Consultants Inc. 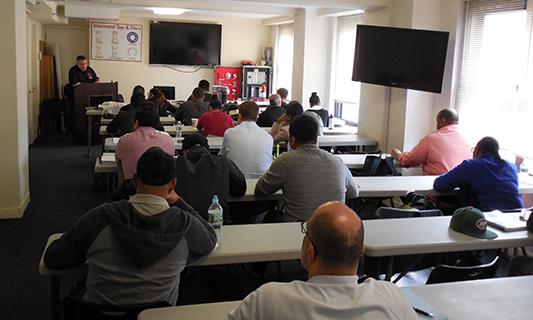 This course is only offer to candidates that failed the FDNY Computer Base Test at 9 MetroTech. A Fire and Life Safety Director (FLSD) is required in any commercial building or occupancy that obtained FDNY approval of the installation of a fire alarm system with two-way voice communication, and is required to provide a Fire Safety Director or other specified emergency preparedness staffing during regular business hours required by Chapter 4 of the Fire Code. Any building classified as Group E (1968 Code) or Group B (2008 Code) by the NYC Department of Buildings, which has an occupancy of 100 people or more must have a Fire and Life Safety Director on site during regular business hours. This includes office buildings, public or civil services buildings, and hotels. The Fire and Life Safety Director must hold a valid Certificate of Fitness and is responsible for implementing a fire safety and evacuation plan, training fire safety personnel (FSP), and other duties related to fire safety and evacuation plans. Apply with the FDNY for your Certificate of Fitness for Fire Safety Director. You will also find links for the FDNY’s onsite exam study guides. Download the FDNY Verification Letter for Application for Fire Safety Director. Our weekday classes are held for a total of four (4) class sessions. You are registering for only component #1 (Fire). If you need to register more than one student, you must create a free account. It's quick and easy! We offer FSLD Component #1 (Fire) on Saturdays for a total of four (4) class sessions.